a thousand faces is a very cool magazine--the quarterly journal of superhuman fiction. It's chock-full of interesting stories and neat interviews, including, in the latest issue, one with me. The online issue (always the current one) is free, and you can also buy older issues. I'd highly recommend checking it out, and not just because the editor was kind enough to interview me. It's a seriously enjoyable read. Check out the latest issue here. You can also go straight to my interview here. 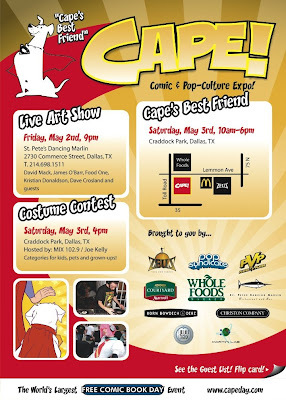 Locals, don't forget to come see me at CAPE in Dallas on May 3. 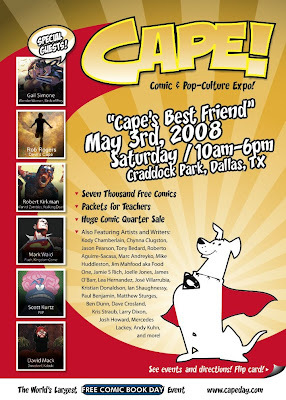 And if you're not in Dallas, please celebrate Free Comic Book Day at your favorite neighborhood comics store (and tell them about Devil's Cape!). For the back of the flyer/card, check after the jump. Rob Rogers takes an odd look at superheroes in a parallel America in which superheroes are a normal part of the environment and have been since the Revolutionary War. 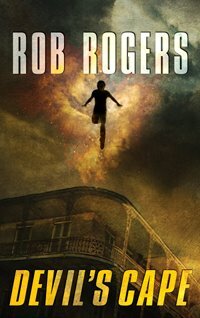 In Devil's Cape (Wizards of the Coast), a corrupt town south of New Orleans, the criminal boss has invited the worst supervillains to town and when a team of superheroes flies in to capture them, they are murdered. It is up to the local heroes (a woman who is the third generation that fight inside a metal suit, two young men who were baptized in water with one hair of the golden fleece and who have superpowers, and a psychiatrist turned demon) to stop them. Yes, it's as much fun as it sounds, and I can only hope for a sequel. A coworker pointed this one out to me. Really funny and clever. The great and powerful Richard Dansky was kind enough to interview me for his web site. Questions touch on topics ranging from the origins of the heroes of Devil's Cape to who would win a thumb-wrestling contest: Superman or the Hulk. Check it out! Thanks, Richard, for the interview. And for those of you who haven't checked out Firefly Rain yet, what the heck is keeping you? On April 18, 1998, I married the love of my life. 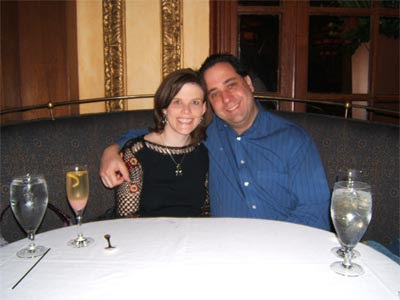 Now we're celebrating 10 years of marriage. I'm a lucky guy. One of the other awesome things Dina for me for the party was have a Devil's Cape bookmark made to give out to people at the party. I just love it and will be passing some out for promotional purposes here and there. It directs people to this blog (so if you've come here by way of the bookmark, thanks!). You can download the high-res bookmark here (thanks, Jeff!). You can see the other side after the jump. 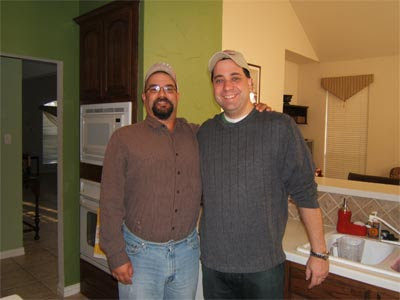 One of the coolest things about the party Dina threw for me was that I got to meet long-time online buddy Jeff Hebert (of HeroMachine fame) in person for the first time. He drove all the way up from the Austin area for the party and was very gracious--helping us to clean up afterward and even drawing sketches for Alex and Zack. What a great guy. He was a big hit at the party, too, getting along well with our friends and impressing my Champions buddies, who've all used HeroMachine. I think he got a good double-take from several people when he told them we'd just met for the first time. The Internet is a cool thing. My lovely wife Dina was wonderful enough to throw me a party to celebrate the launch of Devil's Cape. It was a really great party--about 40 wonderful friends showed up and were supportive, we had some great food, we played superhero music, etc. It was a great, memorable party. Look to the left to see the awesome cake that Dina had made to celebrate the event. It was chocolate, of course, and it was really neat to see it. I finally selected the music for the party and made a mix CD, but I'm not sure how many people really noticed it with all the party conversation. Highlights included Michael Bublé's "Spider-Man," Queen's "Flash Gordon," Paul Anka's "Eye of the Tiger," and Bonnie Tyler's "Holding Out for a Hero." I took a great picture of Dina using a blowdryer on some lettuce before the party, but she declined to let me post it. It's odd, but touching, to be asked to autograph books in your own dining room. Maggiano's Little Italy is awesome, including when catering. I wish I had better pictures of everything. I was too overwhelmed and preoccupied to take particularly good pictures. I'm already looking forward to the next book launch party. I'd better getting that sequel cranking along. Today was a fun experience. 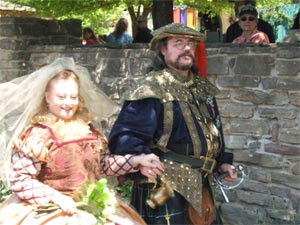 Our friend Erika (Dina's best friend's sister) and her now-hubbie Alan were married at the Scarborough Faire festival, in full garb (Renaissance-style clothing). 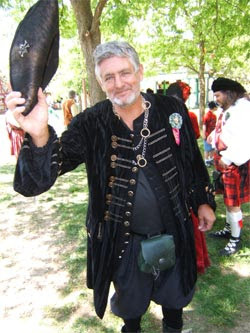 It was a beautiful service and accented wonderfully by the costumes that Erika (a professional costume designer) created for the wedding party. 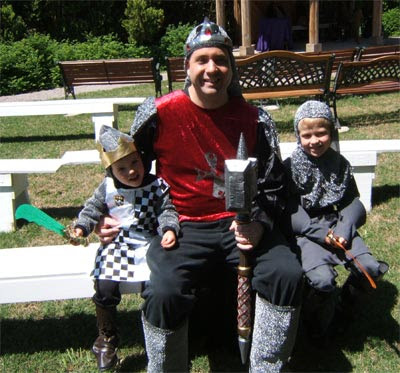 Alex, Zack, and I were dressed as knights (our costumes were store-bought and mail order, but well received) and had great fun. More costumes after the jump. Chris Sims has reviewed Devil's Cape as part of his "Week in Ink" feature over at his site, Chris's Invincible Super-Blog, also known as the ISB. I've long enjoyed Chris's irreverent wit, so I was a little nervous at the idea of him turning his laser eye* on my book, but overall, he liked it. As much as the story is about its three main characters and their “origin story” as individuals and as super-hero team, I think it’s fair to say that it’s even more devoted to the city of Devil’s Cape itself: Founded by pirates and ruled over from the shadows by super-villains, it provides a distinctive backdrop that Rogers weaves right into the characters and their actions. Simply put, it’s a city where evil wins–and has been doing so for quite some time. You'll have to scroll down a bit on his entry to get to the Devil's Cape stuff. * Wow, Chris Sims with a laser eye--that concept could fuel a whole comic book or a very, very wrong after-school special. And I don’t mean in the “Guy Gardner was an awesome Green Lantern” kind of not-really-that-awesome, but “Batman kicking the crap out of Superman in Dark Knight Returns” awesome. In other words, it’s really, really good. I'm grateful to Jeff for the very kind review. He's a great guy. 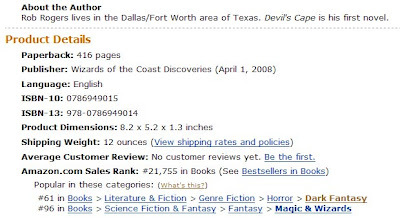 Speaking of rankings and such, Devil's Cape has been reviewed on several web sites, but so far, no one has reviewed it on Amazon.com. If you've read the book, I'd appreciate it if you'd give it an honest review on Amazon. BN.com, too, for that matter (there's a snippet of a review there, but it's kind of a mixed bag). 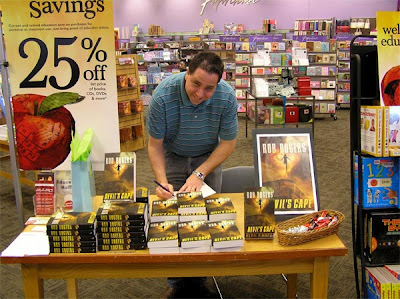 Well, I had my very first book signing on Saturday night at a local Borders (that's me, above, signing buddy Michael's copy of Devil's Cape. Yeah, I look like I'm planning to invite him over for some fava beans and a nice chianti, but that's just a result of me not being particularly photogenic. 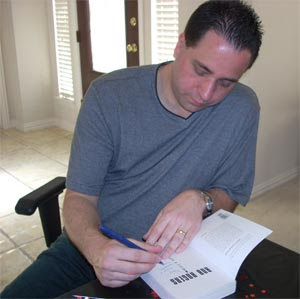 I've attended a few book signings in the past, but they've always been for big-name authors. They sit at a table or stand with a microphone, read some passages of their latest books, answer questions, etc. Coming to a signing is typically an investment of a certain block of time. That's not really the way that kind of thing works for relatively unknown writers like me. Mostly you get a few friends dropping by and a few curious people who have heard about it from the bookstore. 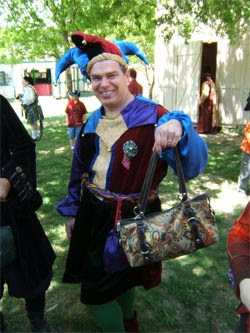 The rest are casual shoppers whom you must lure over to your table. Many scattered thoughts after the jump. Borders had initially shown me a back area where I could set up, complete with a bunch of chairs for people to sit in, etc. When I arrived, they offered me the option of setting up at the front of the store instead. I politely declined at first--sometimes changes in plans throw me a bit and I was nervous as a cat, so I decided to stick with the original plan. But after about half an hour, despite having gotten a couple of strangers and some friends to buy the book, I realized that I would indeed do better up front, and moved forward. You'll notice some chocolates in front of me. That "want some chocolate?" lure is an idea that fellow Discoveries author J.M. McDermott shared with me. (Thanks, Joe!) I didn't end up using it much--instead, I cast out with "do you like superheroes?" pretty often. But it was a good idea and I might use it again. It was very kind of several coworkers and friends (including Andy of Lunar Adventures) to make time to drop by. A Borders staffer snapped some pictures of me with some friends with my digital camera, but pushed the wrong button or something--no pictures. Bummer. One lady came over after hearing some (presumably witty) banter between Michael and me. She said she thought her son might like the book, but that he would disdain an autograph, finding that to be "too normal." Michael jokingly suggested that I rip it or spit on it instead, and that actually got her attention. She asked me to stomp on the book as hard as I could and leave an impression on the cover. Well, the customer is always right... I stomped away. The book is pretty tough (must be all those superpowers inside), so I really didn't make much of a dent, but she was pleased. My original plan was to have a sign printed before the event--something that I can carry around with me to a number of events. But I dragged my feet, trying to decide between various options (most of them pricier than I would have expected) and ended up just printing out a copy of the cover and pasting it on some scrap posterboard. I'm glad I did. It's not the kind of thing I'm going to want to use often, but I'm glad I didn't immediately plunk down a Benjamin or two on a sign with just the book's cover on it, as I'd planned. I decided that I need a little something more that captures the idea of the book--something evoking action, adventure, superheroics, etc. 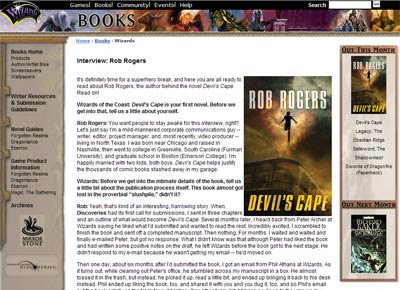 I might go with a short blurb from a reviewer or something like the banner ad I have here with "Devil's Cape, Louisiana. 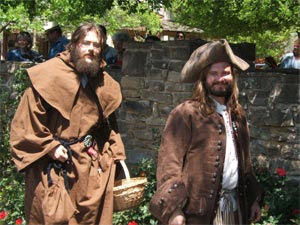 Founded by pirates. Ruled by villains. Desperate for heroes." Anyone have any suggestions? On a similar note, one friend and coworker suggested I might want to change my "Do you like superheroes?" approach. She said it would turn her off, since she doesn't like superheroes (and I did get several people who quickly said, "No," and walked in the other direction). On the one hand, saying something like "Do you like adventure stories" might be safer. On the other, at its heart, the book is a superhero book. I don't know. I'm torn. The world comes full circle sometimes. My first-ever job (a summer job after my senior year in high school) was for a market research company, stopping people in malls and getting them to give their opinions about various ads or products. Approaching complete strangers like that was outside of my comfort zone then and it still is today, but I'd better get used to it. I will say that I seemed to get a little more comfortable with it as the evening went on. Note to self: Even when you think everything is locked down and ready with a bookstore, get it confirmed an extra time or three and be prepared for it to go wrong. The people at Borders were very nice, but they dropped the ball on the publicity they'd promised--no mention in their newsletter, no listing on their web site, no flyer about the book, despite initial assurances that these things would happen. The guy I dealt with told me that part of this was because the event wasn't confirmed 30 days in advance. That would have held more water, but we actually confirmed it 33 days in advance. And it doesn't take 30 days to update a web page anyway, folks. Oh, well. About halfway through my time there, someone made it out of the back door of the store with a bagload of DVDs. A nerve-jangling alarm went off for close to 15 minutes straight. After that, a lot of the staff was occupied with police reports, gawking, etc. Up until that point, they'd been making regular announcements about me, suggesting people drop by my table--about every 15 minutes. After the theft, that pretty much ground to a halt. The thief probably works for the Robber Baron (Devil's Cape reference there). Anyway, overall it was an enjoyable experience and a good learning experience. I sold a decent number of books, I was told, and signed a bunch more for the store. Good times. 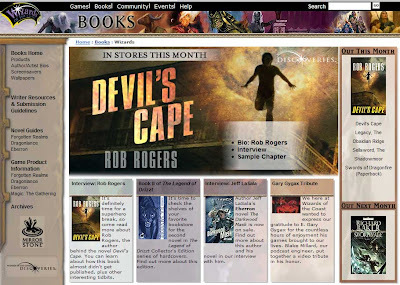 Devil's Cape is the featured book this month in the book section of wizards.com. It's pretty exciting seeing it out there so big and all. We interrupt this blog to bring you footage of an exploding whale. Just because. 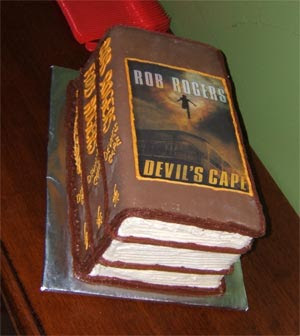 Devil's Cape was reviewed over at Charles Tan's Bibliophile Stalker blog. While the superhero genre is prolific in comics, that's not the case when it comes to fiction (save for the occasional foray from the likes of Chabon or Grossman or the media tie-ins). Rogers tries his hand in the genre with Devil's Cape and delivers something quite different. Visit Charles's excellent site for the full review. Thanks, Charles, for taking the time to review the book. Wizards of the Coast has posted an interview with me on its books page. Check it out to find out how Devil's Cape escaped the slush pile, which actor partially inspired a character in Devil's Cape, what Ghostbuster I am most like, and more. At the beginning of the book the author takes a trip back in time several years as he builds the foundation of the story, it’s a long but interesting build, and the reader will realize its necessity when they reach the present day and the story begins to unfold. The characters are well thought out and interesting. Check out the rest of the review on his blog. UPDATE: An anonymous visitor pointed out that the review contains a spoiler. It's not quite as big of a spoiler as it might seem to be, as it references something that happens early on in the book to a fairly minor character, but just consider this a mild spoiler warning on my part.